So you want to learn about current astrophysics research? You’re in luck! Not only are there many excellent blogs, pretty much all of the peer reviewed literature is out there accessible for free. In many areas of science, the actual papers are behind paywalls and very expensive to access. Astrophysics, like a few other areas of physics and mathematics, puts most papers on the arxiv.org preprint server where they are all available for download form anywhere. In addition, we have a very powerful search tool in the form of the NASA Astrophysics Data System which allows you to perform complex searches and queries across the literature. This is just the top of the page but it already contains a ton of information. 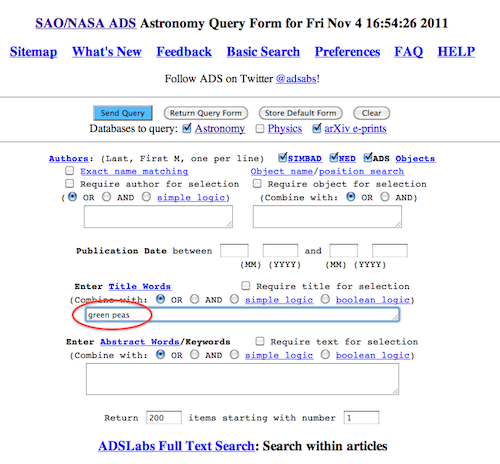 Most importantly, the page has a link to the arxiv (or astro-ph) e-print (highlighted). 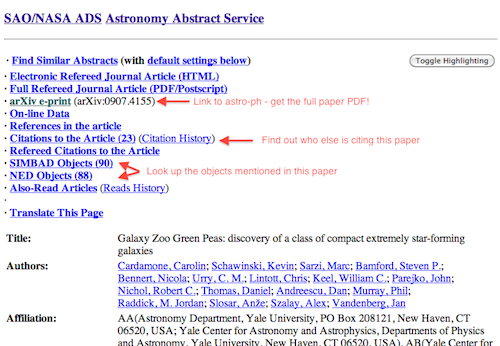 Clicking there will get you to the arxiv page of the paper where you can get the full paper PDF. Also there is a list of paper which are referencing Cardamone et all, at the moment 23 papers do so. By clicking on this link you can get a list of these papers. Similarly, just below, you can get a list of paper that Cardamone et al. is referencing. Lower still are links to NED and SIMBAD, two databases of astronomy data. The numbers in the brackets indicate that SIMBAD knows 90 objects mentioned in the paper, and NED knows 88. By clicking on them, you can go find out what those databases know about the objects in Cardamone et al. (i.e. the peas). Obviously there’s a lot more, but just with the arxiv and NASA ADS you can search and scour the astrophysics literature with pretty much no limits. Happy resarching! Today on astro-ph the Peas radio paper has come out! I discussed the details of the radio observations in July, after the paper had been submitted. The refereeing process can take several months, from the original submission until the paper is accepted. The paper is very exciting to all of us that worked on the original Peas paper, because it is a great example on how these exciting young galaxies (not too far away) are giving us insights into the way galaxies form and evolve. In the case of the Radio Peas, the observed radio emission suggests that perhaps galaxies start out with very strong magnetic fields. The Peas – Now detected in Radio! Last September I blogged about a proposal that had just been accepted at the Giant Metrewave Radio Telescope (GMRT) to follow up on the Peas with radio observations. Now the observations are in, and we have successfully detected the Peas at radio wavelengths! The Peas, which have very high star formation rates, are expected to host a large number of supernova, which are created when the most massive stars die. These supernova create shocks that accelerate electrons in galaxy to relativistic energies. These relativistic electrons emit a type of emission, synchrotron radiation, that is visible in radio wavelengths. Therefore, the radio emission can tell us about the stars that live (or lived) in the galaxy. Three of the Peas from our paper (Cardamone et al. 2009), were followed up with deep observations using the GMRT. It turns out that the Peas have comparable, but systematically lower flux when compared to local starbursts. Using the observed radio emission, the magnetic field of the galaxy can be derived. 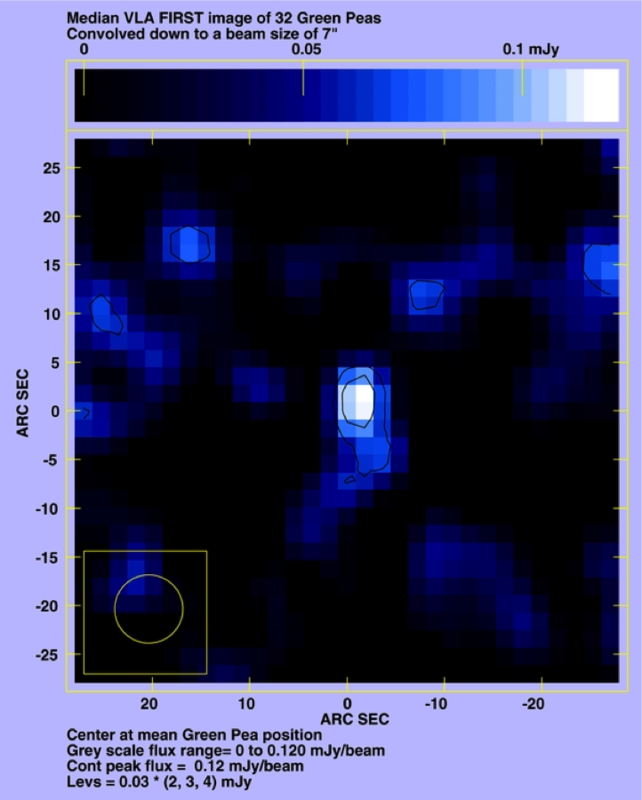 These new observations suggest a magnetic field in the peas similar to that of the Milky Way. Because galaxies are thought to build up their magnetic fields over time, it is surprising to see such a large magnetic field in such a young galaxy. (Estimates of the age of the stars in the Peas are roughly 1/100th that of the age of the stars in the Milky Way). One of the reasons that the Peas are so fascinating is their similarities to vigorously star forming galaxies found in the early universe (known as Lyman Break Galaxies). 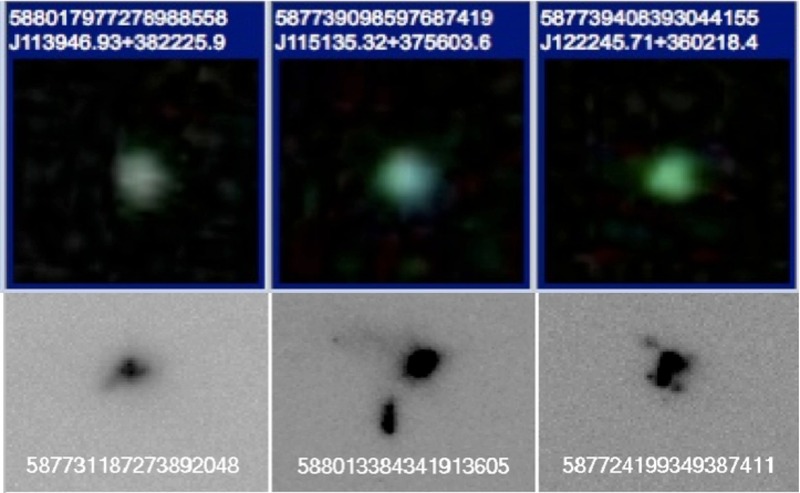 These Lyman Break Galaxies are so far away, they haven’t yet been directly detected in radio emission. However, estimates of their radio flux (from a technique called ‘stacking’) also suggest consistent radio fluxes with those observed for the Peas. These observations suggest that galaxies like the Peas (and the Lyman Break Galaxies), may start out early in their life with very large magnetic fields. These observations challenge the assumption that galaxies build up their magnetic fields slowly over time and it is another piece of the puzzel in understanding of how galaxies are formed. The article will be coming soon to astro-ph and I will post it here to let you all know. The latest on the peas – do they lack metals? It’s sometimes difficult to know which papers will excite other scientists and get them to follow-up what you’ve done. Our peas paper already has seven references to it, so I wasn’t entirely surprised to find a whole paper discussing the peas on astro-ph today. Astro-ph is required reading for all astrophysicists and contains pre-prints of papers that are updated every day. Some papers are posted when they’re submitted to a journal, others only once they’ve been accepted. A wonderful thing about the field of astronomy is the free access to data and the wide sharing of ideas through forums such as astro-ph. This creates new and exciting scientific results at an amazing pace. This paper, written by Ricardo O. Amorín, E. Pérez-Montero and J.M. Vílchez (all at the IAA-CISC), follows up on one of the aspects of the peas: the metallicity (amount of elements other than hydrogen and helium) that are polluting the gas in the peas. These elements (or metals, as astronomers confusingly say) are generated in supernovae, so the metallicity,and the ratios of specific elements, can give astronomers some idea of how “evolved” a galaxy is. The more metals, the more supernovae must have gone off and polluted the gas. What they find is different from our paper. Using a different method to measure the metallicity of the peas, they include the abundance of Nitrogen. This turns out to be anomalous in the peas, and suggests that the peas are less metal-enriched than we concluded. They then look at whether the peas have the amount of metals that other galaxies of similar mass have, and conclude that the peas are off the “mass-metallicity relation” (see plot above – green points are the peas,which are below the grey shaded area representing normal star forming galaxies). This is definitely different from what we concluded – we deduced that the peas are actually on the mass-metallicity relation. So who is right? We don’t know yet. The Amorin et al. paper is appearing in the Astrophysical Journal as a Letter and hopefully starts off a debate on the topic. Stay tuned! Our pea hunting observing run is over and, as you will have gathered from previous posts, it has gone very well. We travelled back from La Silla to Santiago last night, for another brief stay at the ESO Guesthouse. Now I’m about to get on the plane back to the UK. We are thrilled with how well the run has gone. I’ve done a rough analysis of the data already and we’ve already started drafting the paper presenting the results! 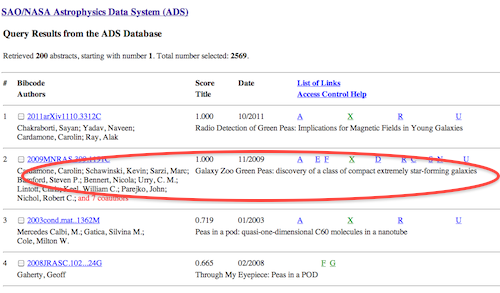 I’ll do a more careful analysis once I get back to the office, but early indications are that we’ve got a nice collection of higher redshift objects that are very similar to the fascinating SDSS Peas that were discovered on the Galaxy Zoo forum, and an almost perfect technique for finding more! I’ll keep you posted as our work progresses. You may have noticed the Galaxy Zoo blog was down over the weekend. Well, it wasn’t the only one to be experiencing technical difficulties. On Sunday night we unfortunately lost four hours of observing time to technical gremlins. First we tried to use a new filter, which resulted in a nice 10 minute exposure of nothing. After a trip to the telescope to look around inside the instrument, the support staff worked out the problem: the filter was mislabelled on the computer. With that figured out, we changed to the correct filter and carried on – only to be stopped in our tracks again a couple of hours later by the whole telescope control system crashing! This time it took three hours of methodical troubleshooting to fix the problem, apparently some problem with a power lead. By then the night was almost over. Well, at the start of the night we were a bit nervous that none of our objects would turn out to be Peas. Fortunately, by the end of the night our quick looks at the data indicate that four of the seven i-Pea candidates that we managed to observe are emission line objects at the redshift we expected our selection to give, i.e. they are Peas! That’s about as good a success rate as we dared hope for. The night hasn’t been without its difficulties. The seeing (how blurry the atmosphere makes our images) wasn’t great for most of the night, and it has turned out to be hard to actually find our targets because they are so faint. Those issues combined meant that we didn’t get through as many candidates as we hoped for, but we are still happy with the collection we got. Right now, time for a quick breakfast then some sleep before trying to net some more Peas tomorrow night. We’ve spent the afternoon finalising our target selection, preparing our observing strategy, and taking calibrations. The sun has now set and we’re already pointing in the right direction for our first target. In a few minutes time we will start our observations. We begin with a standard star, which will be used to calibrate the spectra of our main targets. The we are on to our first Pea candidate. The SDSS Peas that Carrie studied were green in the SDSS colour images because they were bright in the r-band, actually the red region of the visible spectrum. On this occasion we are looking for similar object that are a bit further away, so we expect them to be very bright in the i-band (further into the red) ar the z-band (on the border between red and the near infrared). Tonight we are observing the i-bright objects, and hopefully we will get through about a dozen of them. The weather looks good, so fingers crossed. Anyway, better concentrate on the observing.